Alán Aspuru-Guzik, a Mexican-American scholar in theoretical and computational chemistry, was recently named a Canada 150 Research Chair jointly appointed to the University of Toronto’s departments of chemistry and computer science. 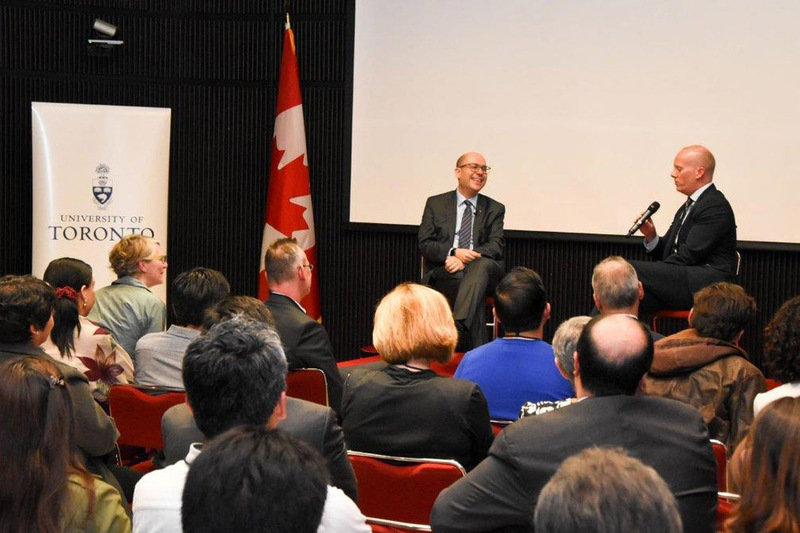 At an event this week co-hosted by the Canadian Embassy in Mexico City, Ted Sargent, U of T’s vice-president international, spoke with Aspuru-Guzik about his decision to move to U of T after 12 years at Harvard University. Ted Sargent: You are a great example of the kind of scholar we are so proud to have at U of T. Tell me the story of how you decided to join us. Alán Aspuru-Guzik: The moment when I decided to leave the U.S., I looked around the globe – Europe, Australia, Canada – for where I wanted to go to. I already had a relationship with Canada through the Canadian Institute for Advanced Research (CIFAR). Within Canada, U of T is a very special place in a very diverse city. I thought, this is where I want my kids to grow up. Fifty per cent of people in Toronto are foreign-born. And there are professors like you, a finalist for the Carbon XPrize. You are the kind of faculty who attracted me to U of T.
Ted Sargent: What will life look like on the ground at U of T? Alán Aspuru-Guzik: U of T has given me a very interesting opportunity. The university is so diverse and dynamic. I will be in chemistry, and I will make compounds with my robots and maybe work together with your lab. We will get our arms around the chemical data from computers and robots using machine learning strategies arising from computer science. In other words, we’ll use robots to synthesize and test chemicals, and we’ll put machine learning in the loop to automate and accelerate the discovery process. Ted Sargent: What will you do with the Vector Institute in Toronto? Alán Aspuru-Guzik: The Canadian government has made a statement about its commitment to AI by creating three institutes in Edmonton, Montreal and Toronto. Vector is a multi-disciplinary institute with academia and industry. It builds on the remarkable legacy of people like Geoffrey Hinton, Richard Zemel, David Duvenaud and so many others. Apart from them, the rest are all the next generation of truly outstanding scholars attracted to Vector and U of T from around the globe. These people are working together with industry to use AI to transform the world. We want to use quantum computing for chemistry, machine learning and other applications in collaboration with Vector. Ted Sargent: You’re also an entrepreneur. Tell us about your startups. Alán Aspuru-Guzik: Yes, I’m an entrepreneur. And recently, the World Economic Forum named Boston the fourth most entrepreneurial city and Toronto the sixth most entrepreneurial city. So I feel good about my decision to come to Toronto. I started two companies this year, one is called Zapata Computing, named for Emiliano Zapata, the Mexican revolutionary, because the company will revolutionize computing. The other is called Kebotix and the CEO is Jill Becker, a U of T and Harvard graduate. We’re committed to opening an office in Toronto for both companies. There is a lot of support from the Canadian government for startups. Ted Sargent: How has your experience with the culture of inclusivity been in science? Alán Aspuru-Guzik: Canada has a remarkable diversity of gender roles. It’s very impressive. During the ceremony in Ottawa when they announced my Canada Research Chair, I thought I’d get a selfie with the prime minister, but he didn’t come. Instead, I got to meet Governor General Julie Payette. She is a U of T grad, an astronaut and an engineer. Also Canada’s Minister of Science [Kirsty Duncan] is a woman, and the chief science advisor to the prime minister [Mona Nemer] is a woman. Mexico needs to do a lot more work on that. Ted Sargent: How does your family feel about the move? Alán Aspuru-Guzik: My mother, wife and children are all very excited. And, it is easier to get from Toronto to Mexico than to get from Boston to Mexico. There are multiple direct daily flights. Toronto and Mexico should have more links and more integration between our countries. We need to reach out and make a strategic connection. Ted Sargent: Tell us more about your research goals. Alán Aspuru-Guzik: I am interested in generating and storing the energy of the world, storing electricity that we get during the day through inexpensive and renewable solar cells and batteries, and then making it available to be used at night. Through our collaborations with the Ministry of Energy in Mexico and the National Council of Science and Technology (CONACyT), Mexico will be a leader in this. Connected to this, I recently co-led an international workshop for the innovation challenge of Mission Innovation, a collaboration of 22 countries and the EU that focuses on doubling the participating countries’ clean energy research budget over five years. Ted Sargent: So great to have you here. Thank you.